At my former blog, I did a little piece each Sunday on Bob Dylan. I called it, surprisingly enough, Dylan on a Sunday. And a few people read it each week, notably my mom and Craig Jenkins. While my blog numbers suggested that people think I say more interesting things when I talk about theology or ministry (that’s probably a good thing), I did become known as something of a Dylan psycho/nut/devotee/gadfly/fan/idiot. I wrote a good number of Dylan on a Sunday posts. Seems he was good source of inspiration for saying something, even if many people failed to appreciate the effort. But recent events have conspired to bring Dylan back for a reboot. The first is that I created a Bob Dylan news category for an app on my iPad. It is not possible for me to get the latest news on Dylan with a mere swipe of my finger. Did you know that he has been playing a grand piano at recent concerts? Or that some woman claims to have found the guitar Dylan plugged in at the Newport Folk Festival in her attic? See how interesting this is! It’s a virtually endless supply or Dylan arcania that could more than keep a blog, the highest of all literary forms, rolling in material. Guys our age? Isn’t this like asking “what do guys your age have about food, or sleeping, or breathing?” Dylan is like a musical food group. You don’t have to like it, but you won’t have a balanced or healthy musical diet without it. Sheesh. What do they teach in schools these days? Have we no national values? Have Nickelback and Taylor Swift ruined the musical sensibilities of the younger generations? Is there no coming back from this? I chuckle every time I hear that line in West Wing. My friend Cassie, who is just a young’un, wants credit for wanting to like Dylan, though she can only listen to covers. And I think there should be credit for that. But it is one of those things that makes me aware that I’m older than I feel. “Guys your age” is a cipher for hopelessly holding on to your youth. For thinking I’m hip and relevant when I’m not. But as long as Dylan keeps touring, I’ll keep the Dylan poster up in my living room (that sounds kind of pathetic). After all, a wedding I performed didn’t have a single Nickelback song, but it did have a Dylan tune. 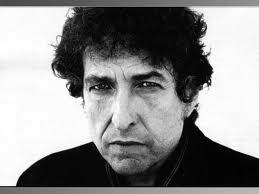 This entry was posted in Music and tagged Bob Dylan, West Wing. Bookmark the permalink. Keep them coming Mark. I saw Dylan last year at Edgefield. Debby and I couldn’t understand a word. His music style is much different now – can’t say what it is exactly but it doesn’t appeal to me all that much. He might have been playing a grand piano. John Mellencamp played the second set and was a great show – I enjoyed it more than the Dylan show. Maybe it was just me that night. Still a Dylan fan just the same. yeah, Dylan’s been pretty raspy lately. I heard him in Dallas about 5 years ago and it was an amazing show. I think I’ll make that my one and only Dylan concert.